The account settings page can be accessed by clicking on the top right hand menu and selecting it from the dropdown. If you use a lot of transient metrics generated by spin-up VMs or on-demand instances, you may want to remove these after a period of time. 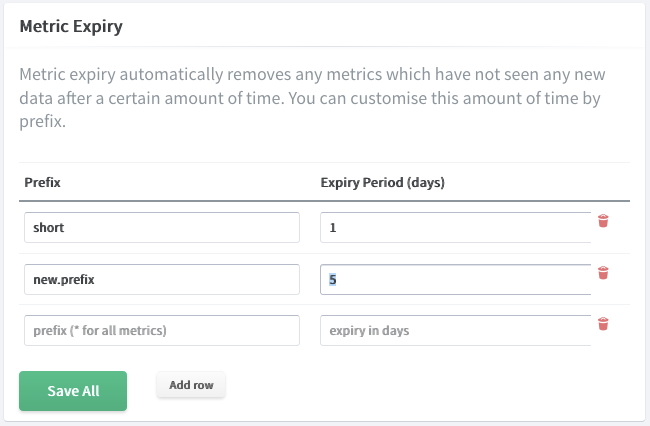 Once you set an expiry limit, the system will automatically remove any metrics which haven’t been updated since that time. E.g. If you set the value to 7, any metric that hasn’t been updated in 7 days will be removed. Prefixes can contain only alphanumeric and *, ., -, _, $, %, #, = characters. Wildcard (* character) is greedy, which means it will match everything which fits into the given pattern, as opposed to Graphite where it matches only one node level. For prefixes that are subsets of each other, the more specific name will take priority. So for foo = 1 and foo.bar = 5, foo and foo.baz and foo.baz.steve will be set to 1. foo.bar, foo.bar.baz and so on will be set to 5. 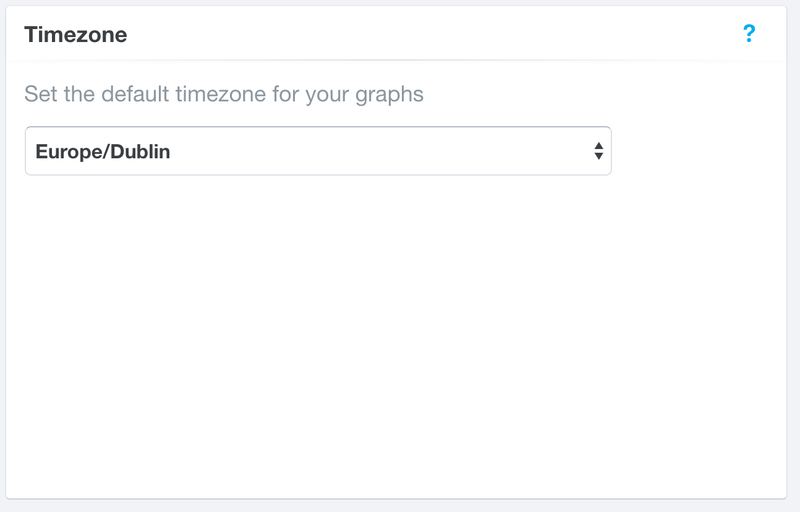 Setting a default timezone within Hosted Graphite ensures that graphs rendered by Graphite are configured to use that timezone. Simply pick the timezone of your choice from the dropdown, and the setting will be automatically saved. You can change the email address associated with your Hosted Graphite account by navigating to the account settings page, clicking on the Advanced Options button at the bottom of the page and selecting enter the new email. After you fill out the form a confirmation link will be sent to your new email address to verify the change. If an account already exists with the new email you’ll need to either rename that one first or contact support to delete it. If you would like to receive a copy of billing invoices to an email address that is different to the one primarily used on the account, please contact support.